Phil Mickelson suffered the embarrassment of an air shot as the third round of the Masters got under way in wet conditions at Augusta National. 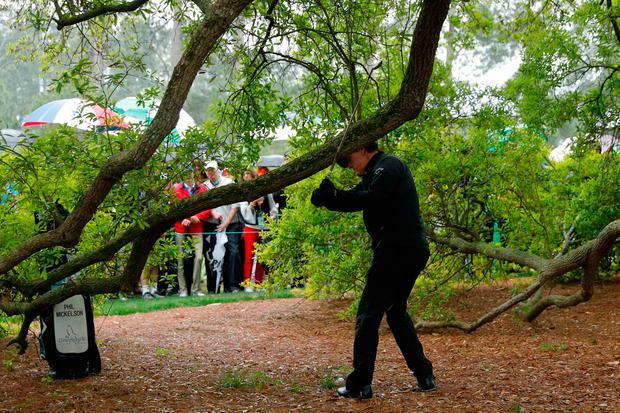 Mickelson pulled his tee shot on the opening hole into the trees to the right of the fairway and caught a branch on his downswing in attempting a trademark recovery shot. That caused the left-hander to miss the ball completely and after punching his third shot on to the fairway, the five-time major winner missed the green with his approach on his way to a triple-bogey seven. Mickelson had been just two shots off the lead before making a triple bogey on the ninth in a second round of 79, equalling his worst ever score in the Masters. But another dropped shot on the second on Saturday meant the 47-year-old was nine over par and dead last of the 53 players to make the cut, with practice round partner Tiger Woods just one place better off. Woods bogeyed the first after failing to get up and down from a greenside bunker and twice found sand on the par-five second to drop another shot. Playing partner Ian Poulter had also dropped a shot on the first, but birdied the second to get back to five over par. The odd number of players making the cut meant Paul Casey was playing alongside marker and Augusta National member Jeff Knox, who famously outscored Rory McIlroy in the same situation in 2014. Casey looked in good shape to avoid a similar fate after following five straight pars with a birdie on the sixth. The final group were not due out until 1430 local time (1930BST), with American Ryder Cup star Patrick Reed holding a two-shot lead over Australia's Marc Leishman. The leading pair are both seeking a first major title with Leishman having lost out in a play-off for the 2015 Open, but eight of the top 13 have at least one of the game's biggest titles under their belts. Former Open champion Henrik Stenson sat four shots off the pace on five under par, with Rory McIlroy and 2015 winner Jordan Spieth another stroke back. US PGA champion Justin Thomas matched Leishman's 67 on Friday to reach three under par alongside the man he could replace as world number one, Dustin Johnson, with Justin Rose, Louis Oosthuizen and Bubba Watson all two under.